What if we lived in a world where the long-term was taken seriously? The Long Now Foundation presented the book launch event for Anathem in San Francisco on Tuesday Sept 9, 02008. Long Now receives a percentage of book sales purchased through this link. 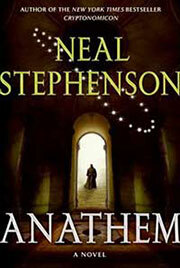 If you are reading Neal Stephenson's ANATHEM, you may be curious about its relationship to the Clock of the Long Now, a.k.a. the Millennium Clock, or the 10,000-year clock. While the clock described in the book is not the Clock of the Long Now, it is not entirely unrelated. You may wish to look at an early description of the Long Now Clock and then at some of Neal Stephenson's early contributions to the project. Or read Stewart Brand's book. Neal Stephenson is a Charter Member of The Long Now Foundation. The Clock of the Long Now is actually being built. If you are interested in seeing the current state of progress of the project you may wish to look at some images of the Orrery or Chime Generator, or the proposed construction site in Nevada. Or come see them at Long Now's headquarters next time you are in San Francisco. You may also want to check out the Long Now Seminar series, which is available as downloadable video, audio and Podcast.